An Introduction to Real Estate Finance serves as the core of knowledge for a single-semester first course in real estate finance. Unlike other real estate finance textbooks, with their encyclopedic but often stale details, it combines a short traditional text with a living website. The book gives students and professors highly applied information, and its regularly updated online features makes it especially useful for this practitioner-oriented audience. It covers fundamental topics such as accounting and tax, mortgages, capital markets, REITs and more. It also addresses the 2008 financial crisis and its impact on the real estate profession. 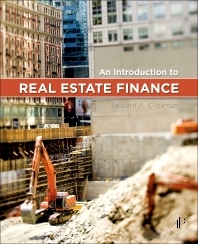 This text is a valuable companion for students of real estate finance as well as financial analysts, portfolio managers, investors and other professionals in the field. Primary: upper-division undergraduates taking a single-semester first course in Real Estate Finance and graduate students in MBA programs. Secondary: financial analysts and portfolio managers working for real estate investors, real estate securities investors, and members of mortgage banking firms. 6.1 Why Invest in Real Estate? 13.1 What is a REIT? Edward Glickman is the Executive Director of the Center for Real Estate Finance Research and Clinical Professor of Finance at New York University's Stern School of Business. He has more than 30 years' experience in the real estate and financial services industry.